Click on each document title below for a description and link to the document. The Administrative Record and major design documents are also available at the Hudson River PCBs Superfund Site Information Repositories. This report includes the final details and specifications for Phase 2 dredging. It includes comprehensive descriptions of the processes and systems to be used both in the river and at the on-land sediment processing and dewatering facility. In January 2008, EPA approved the Phase 2 Dredge Area Delineation report (Phase 2 DAD), prepared by General Electric Company which identified the areas that will be dredged during the second phase of the project. 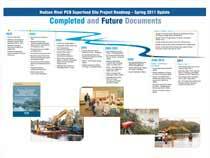 The Phase 2 DAD Report was used by GE to design Phase 2 of the dredging project. This report evaluates the existing technologies identified in the Preliminary Design Report for effective implementation of the Hudson River project. It addresses the requirements of EPA's Quality of Life and Engineering Performance Standards, and incorporates results of the sediment-sampling program and the treatability studies. This report also specifies the following for Phase 2: dredging technology and equipment to be used; measures that will be used to control PCB resuspension; how water will be extracted from dredged material and treated at the on-land sediment processing and water treatment facility; and how sediments will be transported to final disposal locations. This work plan describes the steps in the design process, including the development of plans to remove sediments from the river bottom; process, dewater and treat dredged materials; transport and dispose of dewatered sediments; and replace habitat in dredged area. Appendix F of the 2011 RAWP [2.7 MB, 119 pp] Appendix F of the RAWP is the Phase 2 Community Health and Safety Plan (CHASP) for 2011. Appendix F of the 2012 RAWP [4.2 MB, 120 pp] Appendix F of the RAWP is the Phase 2 Community Health and Safety Plan (CHASP) for 2012. EPA issued performance standards for Phase 2 dredging based on the knowledge gained during Phase 1 and input from the Peer Review Panel. This plan describes key health and safety personnel for Phase 2 and include detailed health and safety plans to protect surrounding communities. It also describes how local emergency personnel and the community will be contacted if an emergency has occurred. Additionally, this report includes measures that will be implemented to insure local residents, communities, and water supplies are protected. This report documents the May 2009 investigation of the Resource U-2 shipwreck site located in the Hudson River, near Rogers Island in Fort Edward, NY. The study was conducted as part of the cultural resources activities that have been undertaken to address potential impacts to cultural and archaeological resources from the dredging project. This report documents the existing range of habitat conditions in the river and along the shoreline in the areas targeted for dredging in Phase 2. The work will support the design of habitat replacement and reconstruction following dredging. After completing the first phase of dredging PCB-contaminated sediment in the upper Hudson River, in March 2010 EPA and GE each released a detailed technical assessment of the work to a panel of independent scientific experts for their review. The EPA report detailed the effectiveness of the first phase of dredging, as well as the challenges encountered during the first dredging season. It also laid out the Agency's proposed modifications to the engineering performance standards for dredging resuspension, residuals, and productivity for the second phase of the project. The panel was asked to consider certain questions relating to the engineering performance standards and the monitoring program for Phase 2 of the project. EPA’s report included the New York State Department of Environmental Conservation’s observations and recommendations as an appendix. The peer review panel publicly discussed its views on the EPA and GE reports in early May 2010 and the members' individual views on the questions were compiled into a report. The Draft Hudson River Peer Review Report [1.4 MB, 100] underwent factual review by EPA and GE and was provided to the public for informational purposes in mid-August 2010. EPA received the Final Hudson River Peer Review Report from the panel in September 2010. During the independent peer review, EPA also sought public comments on the EPA and GE reports. EPA accepted public comment on the Phase 1 Evaluation Reports until April 26, 2010. In response to requests from the public, EPA provided additional time for the public to submit comments on the Addendum to EPA's report. Public comments on the Addendum were accepted until May 17, 2010. These comments were provided to the panel members for consideration during their evaluation. In December 2010, EPA issued performance standards for Phase 2 dredging based on the knowledge gained during Phase 1 and input from the peer review panel. The second phase of dredging began on June 6, 2011. *Please see subsections below for Appendix II-D & E.
On February 17 and 18, 2010, the Phase 1 Peer Review Panel for the Hudson River dredging project held an Introductory Session in Saratoga Springs, NY at the Gideon Putnam Hotel. The focus of this meeting was for the Peer Review Panel to hear presentations from U.S. EPA and General Electric Co. regarding information gained during Phase 1 of the dredging project. Evaluation reports prepared by U.S. EPA and GE were reviewed with respect to the Engineering Performance Standards (resuspension of PCBs, residual contamination, and production rate). The second meeting of the Hudson River Peer Review Panel was held on May 4, 5 and 6, 2010 at the Queensbury Hotel in Glens Falls, NY. During this meeting, the Peer Review Panel members publicly discussed and considered their individual responses to the charge questions that were presented to the panel. In order to implement the cleanup of PCB-contaminated sediment in the Upper Hudson, a processing facility(ies) needed to be constructed to remove the water from the dredged sediment and to prepare the material for transport to approved disposal facilities. After evaluating a series of locations, with extensive public input, the Energy Park site in the Town of Fort Edward was selected. The main operations that occur at the facility include: unloading of dredged sediment from barges to the facility; processing and dewatering of sediment; water treatment; and railcar loading for the transport of dredged sediment to permitted off-site disposal facilities. This report identifies the criteria and process that were used to identify and select the site of the sediment dewatering facility. This report provides the results of the evaluations and screening used to identify the 24 preliminary candidate sites for the sediment dewatering facility. This report summarizes the facility siting process from the initial Concept Document to the identification of Suitable and Recommended sites. The document describes how the final candidate sites were evaluated and selected. This report also presents conclusions about the feasibility of water-based facilities. This report is an update to the Draft Facility Siting Report that was released for public review and comment in April 2004. The Facility Siting Report summarizes the facility siting process from the initial Concept Document to the identification of Suitable and Recommended sites. The report also describes how final candidate sites were evaluated and selected. The final report includes comments received during the public comment period on the Draft Facility Siting Report. Baseline monitoring is used to document river conditions before dredging begins and provides the data needed to support development of dredging and post-dredging monitoring programs. Baseline monitoring continues during the dredging off season and was conducted throughout 2010, between the end of Phase 1 and the start of Phase 2. This report describes pre-dredging or "baseline" fish and water quality monitoring that would be used to evaluate whether dredging activities are achieving EPA's engineering performance standards and to track long-term recovery trends. Baseline monitoring is meant to document the condition of the river prior to dredging and to provide the data needed to support development of the dredging and post-dredging monitoring programs. The river conditions of primary interest include PCB concentrations in the river water, PCB mass load from the Upper Hudson River to the Lower Hudson River, and PCB concentrations in fish. This Quality Assurance Project Plan is consistent with the approved Baseline Monitoring Program Scoping Document, August 2003, which defines the goals and details of the Baseline Monitoring Program. This report describes pre-dredging or "baseline" conditions, including PCB concentrations, in the river's fish and water, following an analysis of data from 2004. These "baseline" conditions will be compared to river conditions during dredging. In addition, these data will be used in the future to help track the river's recovery after dredging is completed. The design reports for the Hudson River dredging project describe dredging processes, locations, and equipment. The report conceptually describes Phase 1 and Phase 2 dredging processes, from removal of sediment to disposal. It evaluates the full spectrum of existing dredging technologies, including dredging equipment; resuspension control measures; material handling and processing; dewatering and water treatment processes; transport to disposal locations; composition of backfill and capping materials; and habitat replacement. The report also includes design criteria based on EPA's draft performance standards, and other EPA criteria identified in the ROD (e.g., no transport of processed sediment by truck; dredged material to be disposed outside the Hudson River Valley). The report compares the general areas of the Upper Hudson River that were candidates for dredging in Phase 1, and identified the specific areas proposed by GE for inclusion in Phase 1. EPA used this document to identify areas to be dredged during Phase 1. This report identifies areas that would be dredged in the three locations for Phase 1 dredging: (1) the northern part of River Section 1; (2) near Griffin Island in River Section 1; and (3) near Northumberland in River Section 2. This report describes where and to what depth, within these areas, dredging would occur. This report evaluates the existing technologies identified in the Preliminary Design Report for effective implementation of the Hudson River project. It addresses the requirements of EPA's Quality of Life and Engineering Performance Standards, and incorporates the results of the sediment-sampling program and the treatability studies. This report also specifies the following for Phase 1: dredging technology and equipment to be used; any measures that will be used to control PCB resuspension; how water will be extracted from dredged material and treated at the on-land sediment processing and water treatment facility; and how sediments will be transported to final disposal locations. This report includes the final details and specifications for Phase 1 of the dredging project. It includes comprehensive descriptions of the processes and systems that would be used both in the river and at the on-land sediment processing and dewatering facility. The work plans that have been prepared for the Hudson River cleanup explain decision-making processes, steps involved in project design, and how monitoring will be conducted. This work plan describes the steps in the design process, including the development of plans to remove sediments from the river bottom; process, dewater, and treat dredged materials; transport and dispose of dewatered sediments; and replace habitat in dredged areas. This work plan describes the studies used to help select equipment for sediment dewatering and handling and treatment of water that is removed from the sediments. These studies also provide information that would be used in refining procedures for loading and unloading barges; handling unprocessed sediment; and staging and loading dredged material and backfill. The SEDC Work Plan describes the technical approach for collecting additional engineering data to assist in the design of the dredging project. The SEDC Work Plan provides the framework for field activities to be conducted by General Electric Company during the Year 2 Supplemental Engineering Data Collection Program (Year 2 SEDC Program) to support the development of the project design, as described in the Remedial Design Work Plan. This plan describes the methods that will be used to monitor the Phase 1 dredging operations so that those operations can be compared to EPA’s performance standards. This work plan describes the steps in the design process, including the development of plans to remove sediments from the river bottom; process, dewater and treat dredged materials; transport and dispose of dewatered sediments; and replace habitat in dredged areas. Engineering performance standards [817 KB, 4 pp] are technical requirements that help to ensure that the dredging of the Upper Hudson is done safely, and meets human health and environmental protection objectives. Performance standards were created to address dredging-related resuspension of sediments from the river bottom, residual levels of PCBs remaining after dredging occurs, and the productivity of the dredging work. During dredging, an extensive water quality monitoring program measures PCB concentrations at upstream, near-field, mid-field, and far-field locations. The performance standard for dredging sets a resuspension level of 500 parts per trillion (ppt) total PCBs – the EPA drinking water standard under the Safe Drinking Water Act. For more information about the standards, and to view performance standard monitoring data during dredging, visit www.hudsondredgingdata.com. This 2004 report describes the final Engineering Performance Standards that were designed to ensure the cleanup meets the objectives for protecting people's health and the environment and does not cause adverse health or environmental impacts. Engineering performance standards were developed for dredging-related resuspension (to limit downstream transport of PCB-contaminated dredging material); dredging residuals (to evaluate the concentration of PCBs remaining in residual material remaining in dredged areas); and dredging productivity (designed to keep the dredging work on schedule). The draft Engineering Performance Standards were released for public review and comment in May of 2003 and for peer review and comment in October 2003. A report summarizing the findings of the peer review and EPA's responses is included with the Final Engineering Performance Standards. In 2010, EPA revised the performance standards for the second phase of the project based on the knowledge gained during Phase 1 and input from the peer review panel. See Phase 2 Documents. The February 2002 Record of Decision required the development of performance standards that set specific goals and requirements for the project. The quality of life performance standards are intended to reduce the effects of dredging; sediment processing, transferring and dewatering; and support operations on the nearby community. EPA reviews project design plans for consistency with the quality of life standards, and oversees cleanup activities to ensure they are met. Standards have been developed for air quality, noise, lighting, odor, and navigation. Monitoring information and data is available on EPA’s Hudson Dredging Data Website. This 2004 document describes the Final Quality of Life Performance Standards intended to reduce the effects of the dredging, sediment processing, transfer, and dewatering, and support operations on people, businesses, recreation, and community activities in the project area. Performance Standards were developed for air quality, noise, lighting, odor, and navigation. This document reflects comments received from the public and the design team. Dredge areas were identified using the results of a multi-year sediment core-sampling program conducted by GE that began in 2002 and generated more than 50,000 sediment samples. Sampling is ongoing to better define the depth of contamination in Phase 2 dredge areas. This report, which provided the data needed to design the remedy, describes the 2002 sediment-sampling program, the methods used for sediment characterization, data management and evaluation, and reports submitted to EPA. The Quality Assurance Project Plan for the sediment sampling program includes a detailed description of the data quality objectives – essentially, why the data are being collected, how they will be used, what they will be compared to, and how they will be interpreted - as well as provisions necessary to ensure that appropriate analytical techniques are selected. Also included in the QAPP are descriptions of sampling methods, analytical and testing methods, sampling locations and frequency of sampling. This report presents the results of the activities performed during 2002 and 2003 as part of the Sediment Sampling and Analysis Program in areas designated as candidates for Phase 1 dredging. The Community Health and Safety Plans (CHASP) addresses potential health and safety issues for the public associated with the dredging project. The CHASP Identifies potential hazards to the community during work in-river, on-shore, and at the processing facility and the control of these potential hazards. Several planning meetings with residents and emergency responders were held to refine the plan. The CHASP will be updated for each dredging year moving forward. This plan describes the key health and safety personnel for Sediment Sampling and includes detailed health and safety plans, including contingency plans, that were designed to protect surrounding communities. It also describes how local emergency personnel and the community would be contacted if an emergency occurred. Additionally, this report includes what measures would be implemented to ensure local residents, communities, and water supplies are protected. This report was developed to ensure that the fieldwork associated with design activities was done in a manner that was safe for the public and the environment. This plan describes key health and safety personnel for Phase 1 and details health and safety plasn to protect surrounding communities. It also describes how local emergency personnel and the community would be contacted if an emergency occurred. Additionally, this report discusses what measures would be implemented to ensure local residents, communities, and water supplies are protected. Revisions to the April 2007 document were issued in February and May 2009. An evaluation of on-land and in-river cultural resources is being conducted to identify archaeological resources of significance so that they can be adequately protected during the dredging project. Prior to Phase 1 dredging, EPA prepared a Cultural and Archeological Resource Assessment [1 MB, 29 pp] which identified a number of cultural resources located within 2,000 feet of the banks of the Hudson River. Some of these resources are listed or eligible for listing on the National Register of Historic Places. During Phase 1 dredging, a series of surveys were completed and the archeological resources discovered were either avoided or were extensively investigated. Cultural and archeological resource assessments have begun, both in-water and on-land, for Phase 2 dredge areas. These assessments have been completed within the Upper Thompson Pool, where on-land archaeological sites were discovered along the shoreline. The effect of dredging in the vicinity of these sites will be mitigated such that any potential impacts to these sites by the dredging will be minimized. EPA also has a protocol for addressing the issue of unanticipated cultural remains that are discovered during dredging operations. EPA works with several consulting parties, including the NY State Historic Preservation Office, NY State Museum, as well as local and regional historic societies, to ensure that local concerns about historical artifacts remain an integral part of the project’s design and implementation. While the New York State Museum is the formal repository for most artifacts recovered, items discovered are expected to be exhibited locally, in project-area communities. This report is a plan that describes how cultural or archaeological resources or artifacts would be identified and evaluated to ensure that that they are adequately protected during the project. Some areas are being repopulated with aquatic plants in the growing season following the year in which the area is dredged. The habitat replacement program is designed to limit impacts on habitats from the dredging project and includes reconstruction, replacement, and/or stabilization of river bottom, submerged aquatic vegetation, wetlands, and shoreline areas. Prior to dredging, shoreline and in-river habitats were surveyed to identify the types of habitat that exist within and around the Upper Hudson River dredge areas, and planting plans were developed for wetland and submerged aquatic vegetation habitat. In both Phase 1 and Phase 2 (Year 1), as dredge areas were backfilled and/or capped, shoreline areas were stabilized and plants and seed mixes were installed in some areas. These areas are being surveyed and monitored to determine if reconstruction areas are developing as expected. After several years of monitoring, the habitats will be measured against various benchmarks and success criteria to verify that they met the habitat reconstruction objectives and that the habitat functions are assessed. This report develops a plan for determining the types and locations of aquatic and wildlife habitat. The Supplemental Habitat Assessment Work Plan presents the approach and locations for collecting additional habitat assessment data to assist in the design of the dredging project. The Habitat Assessment Report for Candidate Phase 1 Areas (Phase 1 Habitat Assessment Report) documents the habitat assessment results for candidate Phase 1 dredging areas that were assessed in 2003 and 2004. Habitat assessment information will be used to develop the basis of design for habitat replacement and reconstruction in Phase 1 areas. The Phase 1 Habitat Assessment Report provides the foundation for implementing the habitat replacement and reconstruction program for the Phase 1 dredging areas. Habitat assessments followed the scope of work outlined in the Habitat Delineation and Assessment Work Plan. In 2002, EPA signed a Record of Decision (ROD) for the cleanup of the Hudson River PCBs Superfund site. The ROD stated that the floodplains, or low-lying shoreline areas, of the Hudson River would be evaluated. The ROD also states that concerns related to possible exposure of residents and ecological receptors to PCBs in the floodplain must be evaluated. Since the signing of the ROD, EPA and GE have collected approximately 5,000 soil samples from floodplain areas of the Hudson from Fort Edward to Troy, NY. The results of the soil sampling will be used as part of a comprehensive study (Remedial Investigation/Feasibility Study) that is planned for the future. This study will include an evaluation of human and ecological risks and potential long-term cleanup solutions. Floodplain sampling is expected to continue in 2012. Previous years’ results have been reported to EPA and distributed to private landowners. Based on those results, GE, with oversight from EPA has taken actions to reduce the potential for people to be exposed to PCBs in floodplains soils. These actions have been taken where elevated levels of PCBs have been detected in areas that people use on private and some public properties. The actions have consisted primarily of the installation of cover material to prevent direct contact with PCBs or placement of signage to warn people that PCBs are present. GE and EPA will continue to evaluate the necessity of taking additional actions to address potential exposures as the project moves forward. The Floodplain Soil Sampling Summary Report details rationale for sampling in floodplains, the implementation of the sampling plan, and summarizes the tasks performed. The focus area of the sampling was a 12-mile-long river reach extending from Fort Edward to Schuylerville, NY. The data gathered during the floodplain soil sampling provide a preliminary indication as to the potential nature and extent of PCB contamination in floodplain soils throughout the 12-mile study area of the Upper Hudson. Results may be useful in the design of future studies that may be necessary to fully delineate the PCB contamination. The Data Summary Report documents the results of the floodplain data collection activities conducted by the General Electric Company (GE) from June to November, 2005 along the Upper Hudson River. The floodplain data collection activities included field reconnaissance, floodplain soil sampling and laboratory analysis, and topographic mapping. In 2008, EPA and GE reached agreement on carrying out the Upper Hudson floodplain sampling program. The agreement, embodied in an Administrative Order on Consent (AOC), provided for soil sampling at approximately 350 properties within the Upper Hudson floodplain and initiated the first phase of the floodplains remedial investigation. The agreement also required GE to map human use and ecological use areas in the floodplain areas to identify areas where removal of contaminated soils may be needed. GE pays for costs incurred by EPA in overseeing the work performed under this agreement. This Data Summary Report (DSR) presents the results of the Upper Hudson River (UHR) floodplains soil sampling activities completed by GE in 2009. The purpose was to collect additional floodplains soil data to further characterize PCB concentrations on certain properties previously sampled by GE and/or EPA in 2008, and newly identified and previously un-sampled potential human use areas. This Field Sampling Plan details the procedures for identifying sediment deposition areas within the Upper Hudson River floodplain study area and determining the PCB concentrations within those areas under the Floodplain Deposition Sampling Program. The FDSP was designed to sample sediment deposits in the Upper Hudson River floodplains during seasonal high-flow events when potentially contaminated sediments can be re-deposited elsewhere in the river system, e.g. the floodplains. This Addendum to the 2008 Upper Hudson River Floodplain Field Sampling Plan describes the collection of additional data in 2010 to further characterize PCB concentrations in certain areas of the Upper Hudson River floodplains. These areas were selected based on previous sampling results, and as part of the overall Remedial Investigation/Feasibility Study (RI/FS) for the Upper Hudson River floodplain. The 2010 floodplain sampling and laboratory analyses will be completed in accordance with this document and the methods and procedures described in the 2008 Upper Hudson River Floodplain Field Sampling Plan and the 2009 Field Sampling Plan Addendum. Subsequent sampling will be undertaken as appropriate and necessary to complete the full RI/FS. This Data Summary Report presents the results of the Upper Hudson River floodplain soil sampling activities completed by GE in June and October 2010. The objectives of the 2010 sampling activities were to collect additional floodplain soil data on certain properties to support planning and design of potential 2010 short-term response actions (June 21 to June 22, 2010 sampling event), and to characterize PCB concentrations on certain properties containing previously un-sampled potential human use areas (October 19 to October 22, 2010 sampling event). This Data Summary Report summarizes the 2011 spring sampling event activities and analytical results for the Upper Hudson River Floodplain Deposition Sampling Program (FDSP). The FDSP was designed to sample sediment deposits in the Upper Hudson River floodplains during seasonal high-flow events when potentially contaminated sediments can be re-deposited elsewhere in the river system, e.g. the floodplains. The spring 2011 sampling event was the second event under this program. Because flooding in 2011 reached a maximum flow of 48,800 cubic feet per second (cfs), significantly more than normal years, GE and NYSDEC collected additional samples outside the original scope of the FDSP. This Addendum to the 2008 Upper Hudson River Floodplain Field Sampling Plan describes the collection of additional data in 2011 to further characterize PCB concentrations in certain areas of the Upper Hudson River floodplains. These areas were selected based on previous sampling results, and as part of the overall Remedial Investigation/Feasibility Study (RI/FS) for the Upper Hudson River floodplain. The 2011 floodplain sampling and laboratory analyses will be completed in accordance with this document and the methods and procedures described in the 2008 Upper Hudson River Floodplain Field Sampling Plan and the 2009 and 2010 Field Sampling Plan Addenda. Subsequent sampling will be undertaken as appropriate and necessary to complete the full RI/FS. General Electric Company (GE), the potentially responsible party at the Hudson River PCBs Superfund site, signed an AOC with EPA in July 2002 (referred to as the Sampling AOC) [73 KB, 37 pp] to fund and perform sediment sampling as the initial step in the design of the site cleanup (dredging project). In 2003 EPA signed an agreement with General Electric Company (GE) to perform the project design work for the cleanup of PCB-contaminated sediment in the Hudson River. Under the agreement, embodied in an Administrative Order on Consent (AOC) [390 KB, 52 pp], GE develop detailed approaches for removing sediment from the river bottom, transporting and disposing of the material, and replacing the habitat in dredged areas. The company also agreed to pay up to $28 million in partial reimbursement of EPA’s past and future costs associated with the dredging project. The AOC covers the detailed design of the dredging project, but does not cover the performance of the actual dredging work itself. The AOC includes work plans for the design of the dredging work, baseline monitoring, cultural and archeological resources assessment, and habitat delineation and assessment. The agreement, embodied in an Administrative Order on Consent (AOC), requires GE to reduce exposure to PCBs in four general areas along the Upper Hudson River where elevated levels of PCBs in floodplain soils could potentially present an unacceptable risk to public health and the environment. The settlement agreement requires GE to install warning signs, cover soils to prevent exposure to PCBs, and periodically monitor the areas and maintain them. These measures are temporary pending completion of comprehensive studies of floodplain areas and selection of final floodplains remedy. The October 2005 agreement with GE includes provisions that cover Phase 1 dredging, the construction of the sediment transfer/processing facility, the independent peer review of Phase 1, and the remaining dredging work. To ensure that contingencies were in place to protect drinking water supplies prior to the start of Phase 1 dredging, EPA issued orders to the town of Halfmoon, New York and the Water Commissioners of the town of Waterford to gain access needed to construct a water line to carry drinking water from Troy to Halfmoon and to the town of Waterford, New York. The new water line is providing the towns with an alternate water source during the dredging project. The agreement, embodied in an Administrative Order on Consent (AOC), provided for soil sampling at approximately 350 properties within the Upper Hudson floodplain. The agreement also required GE to map human use and ecological use areas in those floodplain areas to identify areas where removal of contaminated soils may be needed. GE will pay for costs incurred by EPA in overseeing the work performed under this agreement. The United States filed the first modification, Consent Decree Modification No. 1, with the Court on March 23, 2009. The modification of the 2006 consent decree required GE to pay a portion of the costs of protecting the Waterford, Halfmoon, and Stillwater, New York water supplies during dredging, and to improve its program for monitoring water quality and further protect the Waterford and Halfmoon water supplies. On August 15, 2011 the U.S. Department of Justice filed in United States District Court a second modification to the Consent Decree between the United States and General Electric Company (GE) regarding the cleanup of polychlorinated biphenyls (PCBs) from the Hudson River. Consent Decree Modification No. 2 revises certain provisions of the Consent Decree to address EPA’s December 17, 2010 decision on changes to the project for Phase 2 and makes adjustments to administrative requirements of the Consent Decree. The Agreement, embodied in an Administrative Order on Consent (AOC), provides for a comprehensive study of the contamination in the floodplain of the upper Hudson River. This will include a human health and ecological risk-based assessment of PCB contamination of over 40 miles of floodplains encompassing more than 3,000 properties extending from Hudson Falls to Troy, New York. The agreement includes additional sampling needed to better understand the distribution of PCBs in the floodplain and will require the development of a Feasibility Study (FS) to evaluate remedial cleanup options for the protection of human health and the environment. GE will pay for costs incurred by EPA in overseeing the work performed. The February 2002 Record of Decision (ROD) calls for targeted environmental dredging and removal of approximately 2.65 million cubic yards of PCB-contaminated sediment from a 40-mile stretch of the Upper Hudson. In the ROD, EPA selected a plan that addresses the risks to people and the environment associated with PCBs in the sediments of the Upper Hudson River. The actions in the Upper Hudson will lower the risks to people, fish, and wildlife in the Lower Hudson. EPA released the Proposed Plan for the Hudson River PCBs Superfund Site for public comment on December 12, 2000. Due to numerous requests by the public, the comment period was extended to April 17, 2001. By the conclusion of the public comment period, EPA received nearly 73,000 separate, individual comments on the Proposed Plan. Each comment is provided in Appendix D to the Responsiveness Summary, along with tables identifying authors and showing the relationships between authors, identified significant comments and master comments. Each of the comment letters and other documents was reviewed, and individual significant comments within each comment document were identified. Similar or related comments were combined into 274 “master comments” in various topical areas capturing the significant issues raised by each of the source comments. A response was prepared for (and is presented immediately following) each of the master comments, drawing from material presented in the Proposed Plan, the FS, or other previous project reports, other literature, remedial projects and individuals, and EPA policy, as well as additional technical analyses performed specifically to address comments or questions raised during the public comment period. Master comments are organized according to topical areas in Book 1 of the Responsiveness Summary and are assigned a three- or six-digit identification number to identify the master comment, the associated response, and any companion tables and figures throughout the Responsiveness Summary. Methodologies used and results obtained from additional technical analyses are presented as “white papers” in Book 2 [1.2 MB, 395 pp] of the Responsiveness Summary. White papers cover a variety of topical areas, providing more in-depth analysis and supporting detail concerning topics addressed in various comments. Phase 1, consisting primarily of a review of existing data, was completed in August 1991. Phase 2, which included the collection and analysis of new data as well as modeling studies and human health and ecological risk assessments and peer reviews, began in December 1991 and concluded in November 2000. Phase 3, also known as the FS, began in September 1998. The Feasibility Study was released concurrently with the Proposed Plan for the Hudson River PCBs site in December 2000. Reassessment Schedule - table of major reports and associated dates. Links to Reassessment Reports - a list of all Reassessment documents available on this web site. Peer Review - information on the peer review process for the Reassessment, with links to charges, summary reports, and responses to the reviewers comments, as available. The Community Involvement Plan (CIP) is the foundation for EPA’s Superfund Community Involvement Program for the Hudson River PCBs Superfund Site. The CIP specifies the outreach activities that EPA will use to address community concerns and expectations. It helps the Community Involvement Coordinator, who serves as the liaison between community members and Hudson River site team members and other agency officials, to advise them on effective and appropriate ways to inform and engage the public. The CIP is a public document, readily available to the community, that community members can use to make sure that EPA is responsive to their needs and concerns. EPA has established the following goals for the overall community involvement program. EPA's Community Involvement Plan (CIP) for the Hudson River PCBs Superfund site identifies tools and activities that will be used to address community concerns. Together they serve as a toolkit for EPA’s public participation program at the site and provide the public with myriad opportunities for involvement in the project. The CIP provides detailed descriptions of these tools and identifies how they will be used to address community concerns and promote public involvement in the project. The CIP also contains a glossary, references, and a series of appendices designed to serve as resources for both EPA and the community. Specific sections include the EPA and project team, local government, and media contacts, and directions on how to obtain additional Superfund and EPA information. A draft version of the plan [3.1 MB, 151 pp] was released to the public for review and comment on April 24, 2003. It proposed that a Community Advisory Group, or CAG, be formed to create a forum through which members of community and stakeholder groups along the entire site can discuss their viewpoints as design and cleanup work progresses. In response to public comments, EPA modified the proposed CIP in a number of areas, foremost among them being the increasing of membership of the Community Advisory Group (CAG) from 17 to 25. The CIP was updated in 2009 in anticipation of the start of dredging. Throughout project design and implementation, EPA will focus efforts on getting public input and providing information on those decisions and activities that have the greatest potential impact on the community and on the big-picture issues that are most important to the public. The purpose of the five-year review was to determine whether the remedial actions at the Hudson River PCBs Superfund Site are protective of public health and the environment and are functioning as designed. This five-year review was conducted for the Remnant Deposits and the in-river sediments of the Upper Hudson River. The review was conducted pursuant to Section 121(c) of the Comprehensive Environmental Response, Compensation, and Liability Act of 1980, as amended, 42 U.S.C. §§ 9601 (CERCLA) and 40 CFR 300.430(f)(4)(ii) and undertaken in accordance with the Comprehensive Five-Year Review Guidance, OSWER Directive 9355.7-03B-P (June 2001).